The new BMW 520d offers executive class travel with economy of 68.9mpg and emissions of just 108g/km CO2; diesels have their advantages. 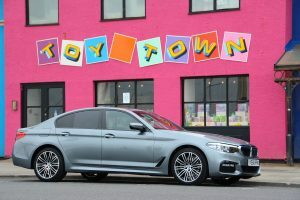 The 5 Series has always been a very good car, and we’ve often wondered how BMW would improve on it with the next generation, but they’ve always found a way. 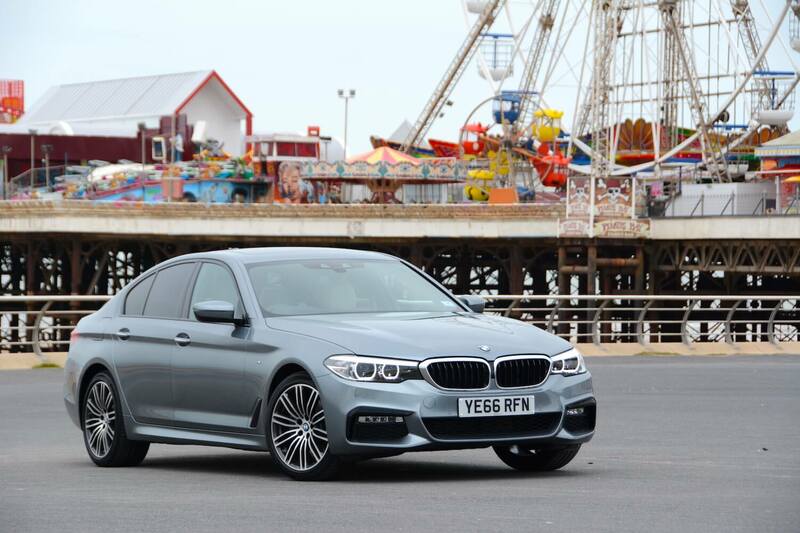 The latest model is a 5 Series perfected in virtually every respect; so are there any chinks in its armour? 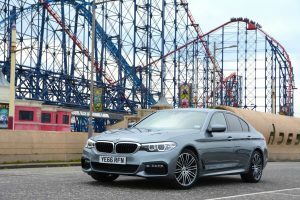 When we first saw the images of the latest 5 Series we thought it was a very conservative mix of design from the previous 5 Series with some details from the 3 and 7 Series thrown in. However when you see it in the flesh, especially in M Sport spec – and the ‘Bluestone metallic’ (ie. metallic grey) colour of our test car helps – the consensus from everyone is that it looks fantastic. Similar comments apply to the interior. Overall it’s traditional BMW, but with subtle updates. 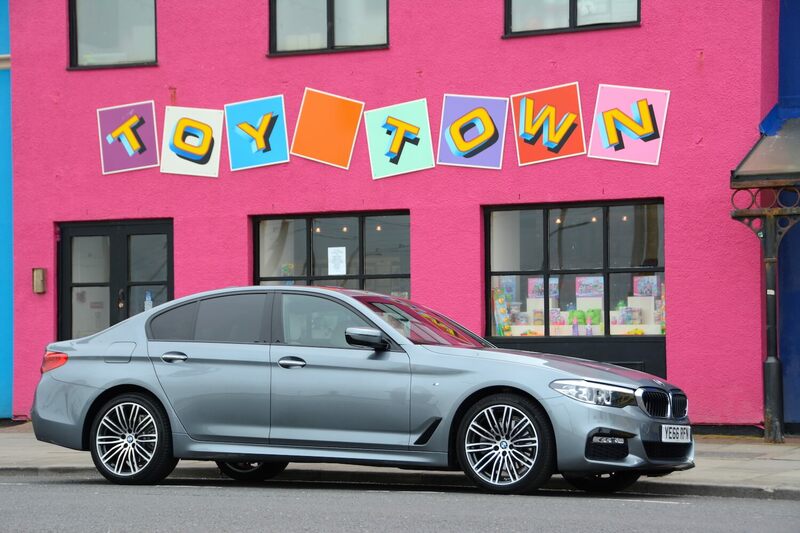 It looks more modern, stylish and upmarket than the last 5 Series (increased amounts of shiny piano black plastic made a predictable appearance in our test car), but it still works really well from a functional point of view – something that BMW excels at. 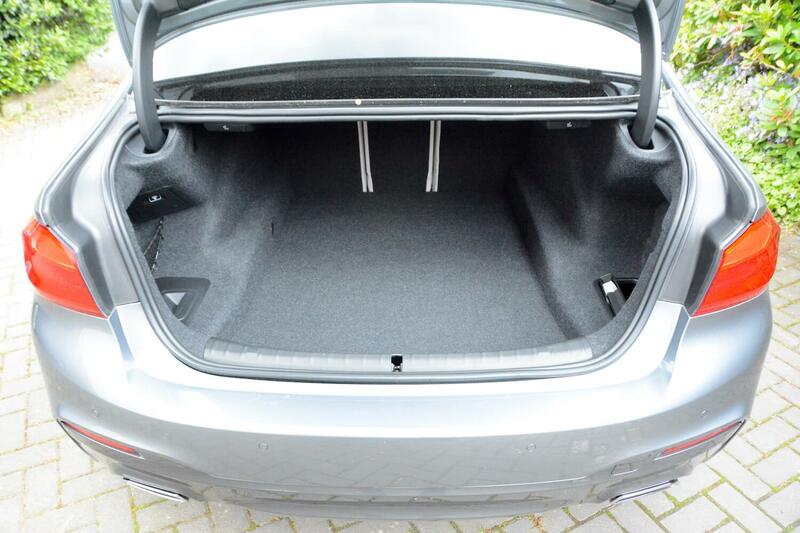 One observation is that there didn’t appear to be as much legroom for rear seat passengers as expected. 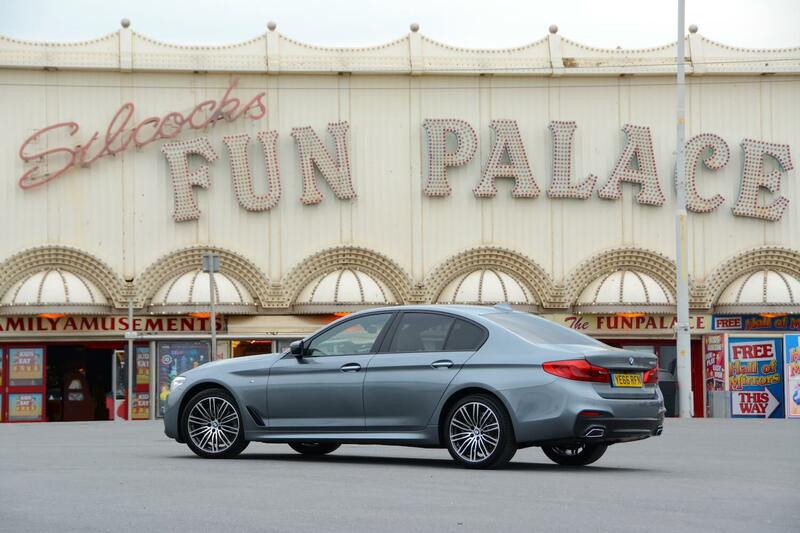 Our test car was a 520d, ie. with a four-cylinder, 2-litre diesel engine, with eight-speed Steptronic transmission. BMW claims that it has shaved off 100kg of weight compared to the previous model. As is usually the case with BMWs, things get off to a good start thanks to the driving position being excellent, with lots of adjustment. And thought seems to have gone into small but important details: lots of cars that we test have uncomfortable protruding shapes and edges of trim on the right-hand side of the transmission tunnel and/or centre console that dig into the driver’s left leg. 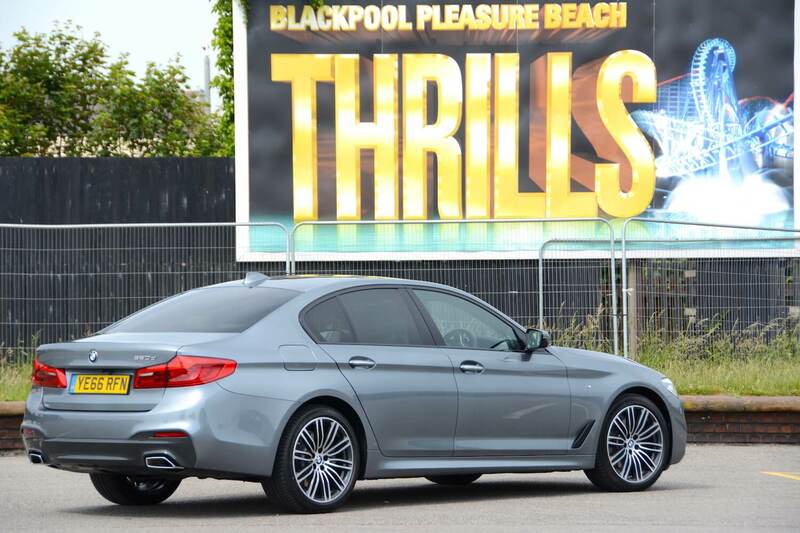 However the 5 Series has a perfectly smooth, curved panel that doesn’t cause annoyance in any way. The interior works perfectly overall, with controls being just where you want them – such as the drive mode buttons, which allow you to quickly and easily choose between Eco Pro, Comfort and Sport, which gives you all the options you should need. The automatic transmission is excellent, always being in the right gear, and changing ratios imperceptibly. There are steering wheel-mounted paddles allowing you to change gear manually. Unlike many competitors, even with the 2-litre diesel engine, there’s no delay when accelerating from standstill. The 5 Series has to be one of the best ways to travel around the nation’s motorways. It’s extremely comfortable, refined, quiet and efficient. If you head onto A-roads, then it has an excellent ride and handling balance. We’ve driven a 540i, and we found the steering to be somewhat on the light side, but the 520d seems to be well judged in terms of weight. This latest 2-litre diesel engine doesn’t feel like a diesel engine. It’s responsive, flexible and refined; if there is any diesel noise, it certainly doesn’t make it into the cabin. The only real issue with the whole car is that if you need to overtake slow vehicles on A and B-roads, then this engine doesn’t deliver the level of performance that you might want. 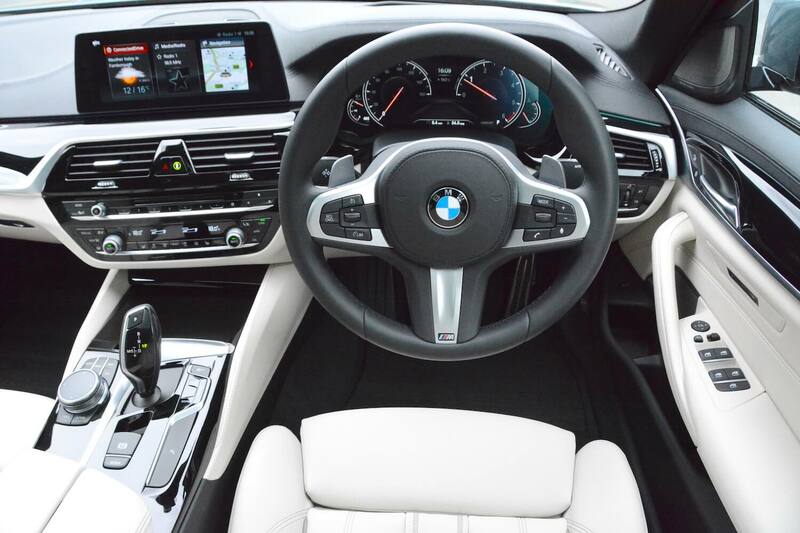 Compared to many other cars that you can buy today, one of the key advantages of a BMW is the infomedia system, controlled by the iDrive rotary controller and some surrounding key menu buttons. This system makes so much more sense than having to reach out and touch small buttons on a screen when driving. 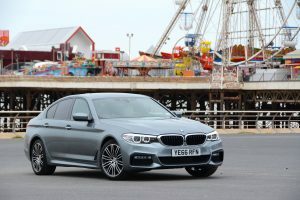 The official NEDC combined economy figure for the BMW 520d (SE) is 68.9mpg, equating to the all-important 108g/km CO2 figure and a company car benefit in kind tax rate of 21% (if you go for the manual gearbox, emissions rise by 1g/km to 109 g/km). However our M Sport spec test car had higher emissions than the base 520d model, at 114 g/km CO2 – but that’s still highly impressive for a car in this class. What economy did we get in real life? As is typical for our week-long tests, around 80% of our driving was on motorways. We averaged 53.8mpg at 70mph, and 47.3mpg over the week as a whole. 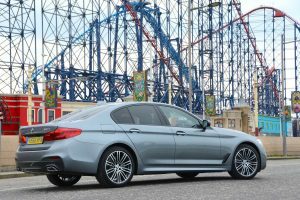 Official economy approaching 70mpg for a premium large saloon is excellent, and you can even choose a BMW 520d EfficientDynamics Edition which can achieve 72.4mpg. Of course there’s also the plug-in hybrid BMW 530e iPerformance. This has emissions of just 44 g/km and an official fuel economy figure of 148.7mpg, but whether you get anywhere close to this completely depends on how far you drive on electric power. 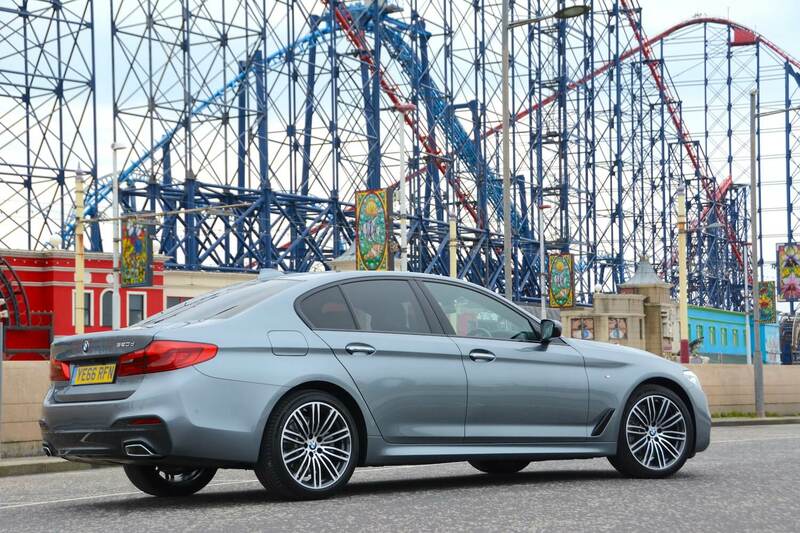 The BMW 520d M Sport Saloon costs £39,025. 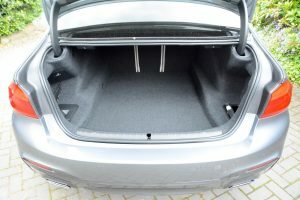 However, our test car was as laden with extras as is usually the case from premium German manufacturers. Some of the option highlights included technology package – which includes display key and head-up display (£1,495), comfort package – which includes electric front seats and reversing camera (£1,995), M Sport Plus package – which includes 19-inch alloys (£1,995), and Variable Damper Control (£985). In total, with all options, our test car cost £48,495. The ‘Display Key’ is described by BMW as a ‘door opener and information centre’. It can direct the car into a parking space by remote control, as well as providing remote operation of the auxiliary ventilation and auxiliary heating systems. It needs to be charged, which can be done by using the inductive charger in the car, or from a USB port. Whether you need this functionality is a matter of personal preference, but you should be aware that the key is large, so fitting it in small pockets in clothing can become somewhat of a challenge. Every day there appears to be a growing movement against diesel cars. The reasons for this are understandable: diesel emissions have an adverse impact on local air quality. However what many in the media don’t make clear is that it’s primarily old cars, buses, trucks and vans that cause the worst of the problems. The latest Euro 6 diesel engines such as in the 520d are actually very clean in terms of NOx and particulate emissions. 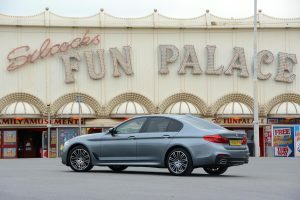 And from the point of view of the motorists who travel many miles up and down the nation’s motorways on business, the BMW 520d has to be one of the most comfortable, convenient and efficient ways to do this; it doesn’t feel anything like a diesel car did even just a few years ago. 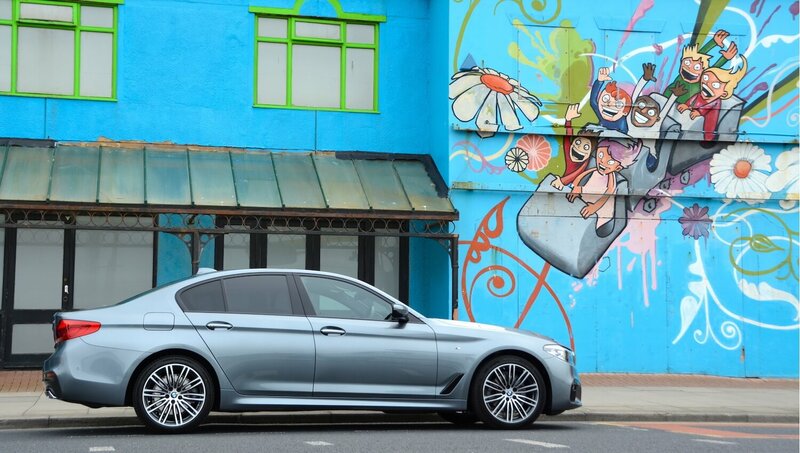 So for carrying out its job so well, the 520d is awarded a Green Car Guide rating of 9 out of 10. It loses one star for not quite having the performance that you might need to pass slower traffic. However there’s a solution to this, and it’s called the 530d. 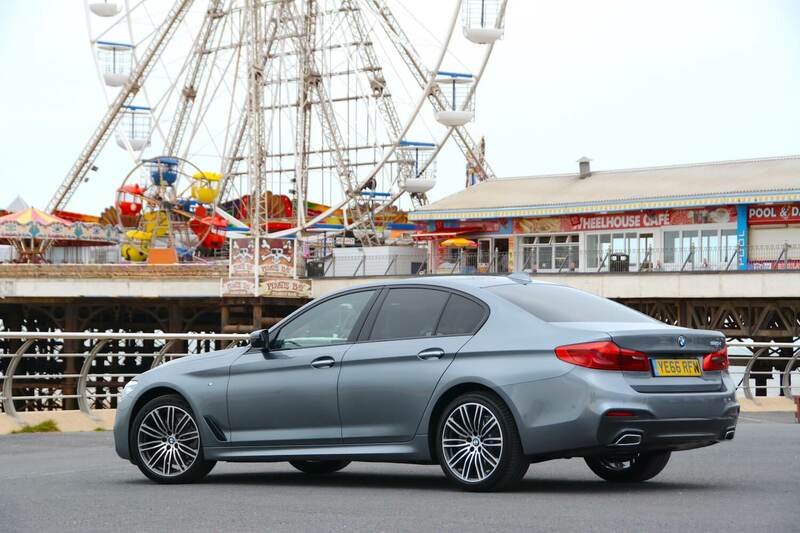 In our view, the 530d is the ultimate all-round 5 Series. 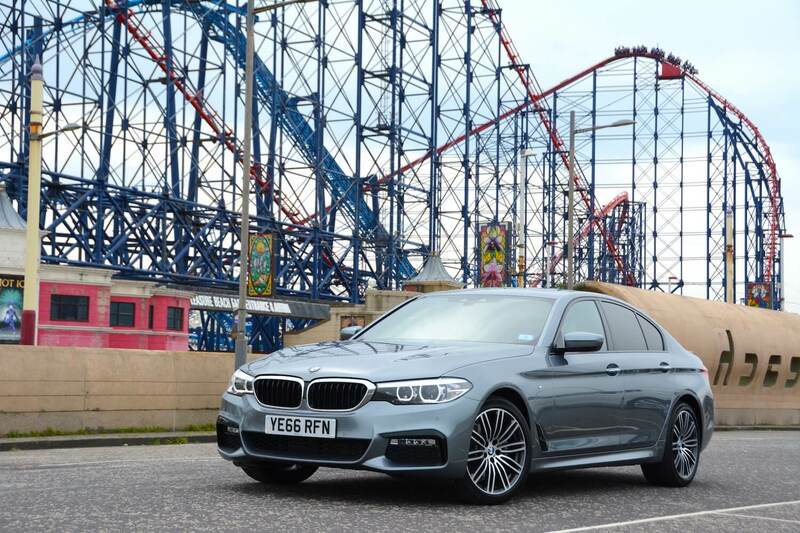 The BMW 530d can still achieve 62.8mpg, equating to CO2 emissions of 118 g/km, compared to 108g/km for the 520d, or 114 g/km for the 520d in M Sport spec. 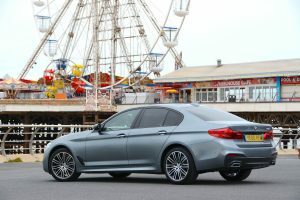 Another thing to consider is xDrive all-wheel drive; the 520d xDrive matches the efficiency of the rear-wheel drive 530d, at 62.8mpg, and 119 g/km CO2. But this is an option that offers even more benefit in all weathers with the more powerful 530d. And then for even more practicality, there’s the 5 Series Touring. If you don’t pile on the motorway miles, then consider the plug-in petrol-electric hybrid 530e iPerformance. 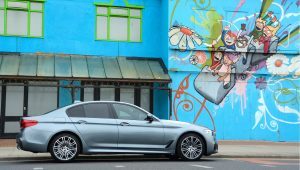 The smaller (and therefore more agile) BMW 330e is an excellent car, offering zero emission driving as well as good levels of efficiency on its petrol engine. 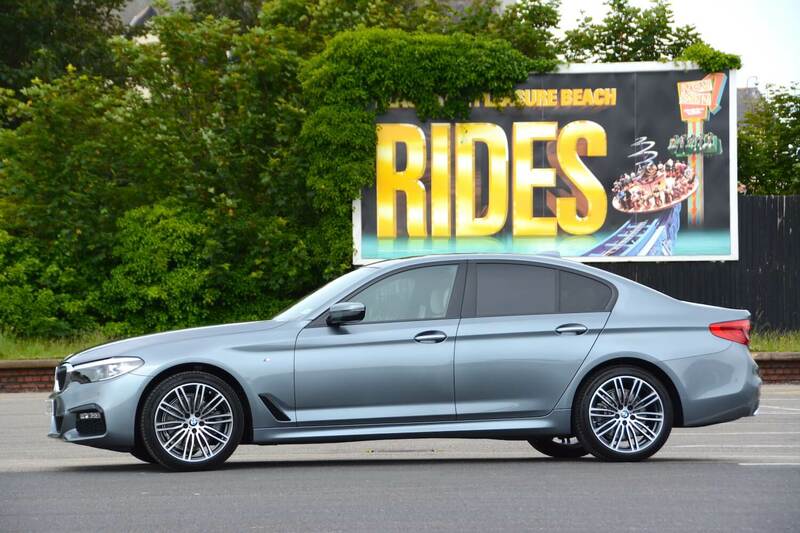 Can the 530e achieve a Green Car Guide review as favourable as the 330e? Read our 530e review coming soon.